Nick Adams nearly didn’t play Felicia in Priscilla: Queen of the Desert, the role that has made him a fan favorite on Broadway. Casting directors originally planned to make Adams an understudy for the role of the young, mischievous drag queen. But then Facebook lent a hand. Fans of Adams created a Facebook group, lobbying for his casting in the role, a la the social media campaign to get Betty White to host Saturday Night Live last year. “The producers actually noticed that people were pushing for me and they paid attention to it,” Adams said. “It’s amazing that the people who have been supportive are able to come celebrate this triumph with me.” It seems the celebration has turned into a never-ending party. Adams has over five thousand followers on Twitter and Priscilla enjoys repeat ticket buyers who have seen the show dozens of times since it opened in March. 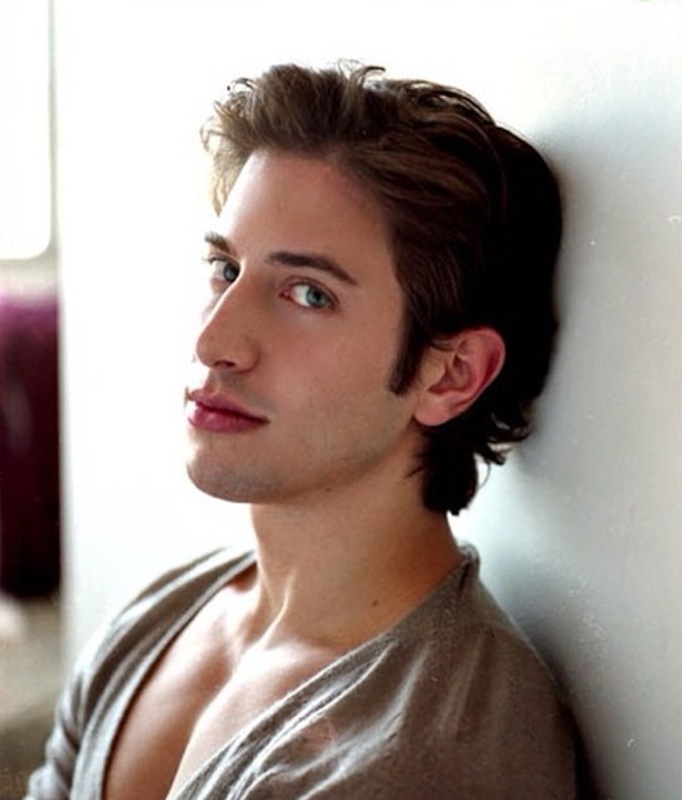 Since making his Broadway debut in Chicago in 2006, Adams, 27, has hit the Great White Way running. His second role as Larry in the revival of A Chorus Line in 2008 got him massive attention, although unintended. Michael Riedel of The New York Post reported that TV star Mario Lopez felt upstaged by Adams’ muscular physique, so producers put him in a less revealing costume and moved him to the back of the dance line. The story was harped on in the gossip columns and tabloids for weeks, but soon all Broadway enthusiasts knew Adams’ name. (Adams and Lopez have since laughed off the incident and are reportedly friends.) A brief stint in the ensemble of the critically acclaimed La Cage aux Folles last spring followed, and then Priscilla’s stiletto heels were ready to be filled. Douglas Hodge has just finished his first Café Carlyle concert and all he wants is a beer. “Stella, a Pilsner—it doesn’t matter,” he says. After burning through 17 songs in an hour, a guy deserves a cold one. If the number of songs isn’t enough to impress, consider that Hodge accompanied himself on piano and guitar—all with a broken wrist, which he acquired while playing with his 11-year-old son. “It’s hard,” Hodge said of the injury. “It’ll hurt in about 10 minutes time.” After departing La Cage aux Folles in February, for which he won a Tony Award, Hodge is making his cabaret debut at Café Carlyle, appearing through March 26. Following his opening-night performance on Tuesday, Hodge sat down with Stage Rush to talk about his music style, his most memorable live concerts, and missing La Cage. 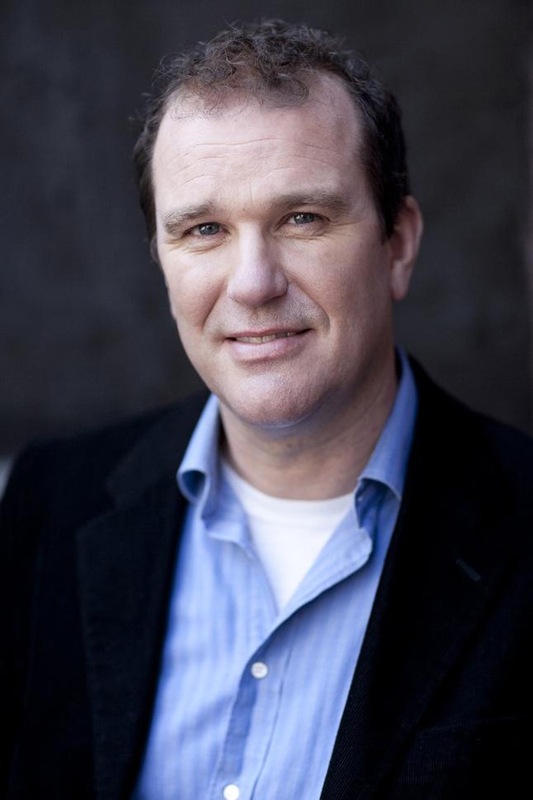 What do you think about the musician side of Douglas Hodge, Rushers? Will you catch him in his Café Carlyle engagement? Do you miss him in La Cage? Leave your thoughts in the comments below, and remember to tune into Stage Rush TV this week for more of our interview with Hodge. 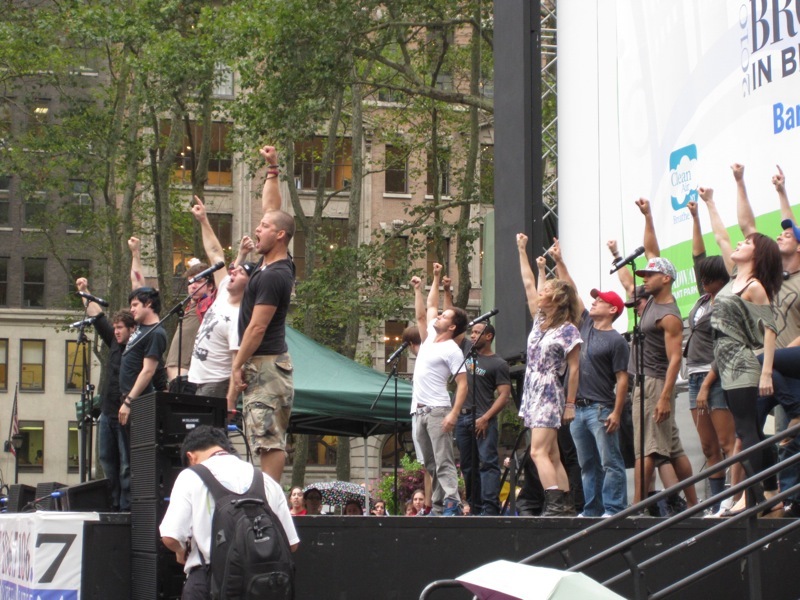 The weather didn’t get the memo that Broadway in Bryant Park still had one more week left in the season. It drizzled on the massive crowd that gathered for the free lunchtime concert’s final show of the summer. But judging from the crowd’s reactions to the buzzy shows that performed, they didn’t seem to mind the rain. The Cagelles of La Cage aux Folles, this year’s Tony winner for Best Revival of a Musical, took the stage first. I wasn’t surprised that Kelsey Grammer didn’t participate in the event, but Douglass Hodge, the Tony winner for Best Actor, could have showed up to belt out “I Am What I Am.” Instead, their merry mass of transvestites entertained the crowd to exuberant applause. Not donning any feminine garb for “We Are What We Are” did come off a bit strange (“Look under our frocks,” what frocks?! ), but their energy was through the roof, especially as they spiked extra large beach balls into the audience. The song began strangely though, as the announcer introduced the song as “What Are We Here For,” and then interrupted the already-in-progress number to give it the correct title. Dale Hensely and Chris Hoch went on as Albin and Georges, respectively, for “With You On My Arm,” which came off dull. The duo then joined the Cagelles for their closing act, “The Best of Times,” in which they paled in comparison to the effusive ensemble.